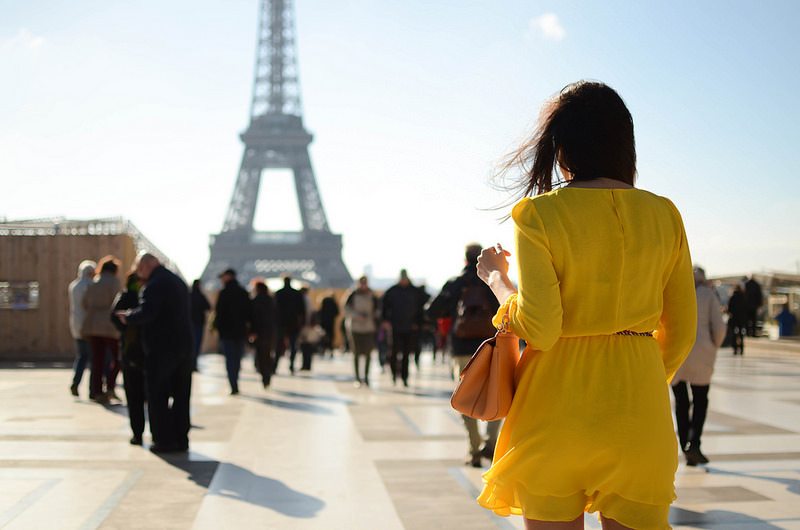 Ohh Paris... That day I was feeling like a free yellow bird in this gorgeous yellow dress ! I love the shape, the color and it's so spring! In fact, the first day of our arrival in Paris the weather was kind of cloudy and cold. But the following days it went much better and as soon as the sun showed up I knew it was time for me to put on this amazing Dimitri dress that I got from La Muse Boutique. I discovered Dimitri which is a super talented Italian designer at La Muse in Geneva and made sure to take one with me to Paris. You guys should get a look out there if you are around Geneva! Their new spring/summer collections are simply to die for ! Back to the outfit, I decided to match the dress with my beloved Miss Sicily bag from Dolce&Gabanna and the belt which is also a Dimitri one. For the shooting, it wouldn't be any better place to immortalize this outfit than in the Trocadéro with the Eiffel Tower on the background ! Isn't true ? Beautiful! Love the bag and the tassel belt! Amazing yellow dress :) Great pictures!